How one becomes Non resident under Income Tax and FEMA and the implications of becoming Non resident? Though the word “non resident” is used interchangeably but the tax laws and Foreign Exchange laws have different connotation of it as the purpose of both the laws is different. Physical presence is only considered under the tax laws and your residential status can normally be determined after end of the financial year based on your aggregate stay in India. So you would be resident of India for the financial year 2018-19 if either you were present in India for 182 days or more during 1 st April 2018 to 31 st March 2019 or you were in India for 60 days or more during the previous year ended 31 st March. 2018 and were also present in India for 365 days or more during the four years 1 st April 2014 to 31 st March 2018. There is relaxation in respect of second condition of stay requirement which will be enhanced to 182 days in stead of 60 days for Indian citizen who leaves India during the previous year either as crew member of an Indian Ship or for taking up an employment outside or an Indian Citizen or a person of Indian origin who comes to India for a visit. So in case you do not satisfy any of these two basic conditions, you would straightway become a non resident. There is one more category of “Ordinary but not ordinary resident” (ONOR) under the tax laws. So once you satisfy any of the above two basic conditions, you would still qualify as a ONOR if you were a non resident for nine years out of ten years period ended on 31 st March 2017 or were not in India for more than 729 days during seven years ending on 31 st March 2017. Implications of becoming a non resident? For a resident global income becomes taxable in India even if such foreign income might have been taxed in other country, subject however to availability of tax credit for taxes paid on such income and double tax avoidance agreement benefits. In contrast for a non resident only the income which is first time received in India or accrues from assets held in India or for services rendered in India only become taxable here. So your salary will become taxable in India if it is directly credited in India while you are working abroad even if you are a non resident. Moreover there are certain tax benefits which are not available to non resident. Non Resident under FEMA ? Unlike under the tax law where stay in India is considered, the foreign exchange regulations go by intention of an individual in addition to stay in India. Though under FEMA a person becomes a non resident if he has been in India for less than 182 days during the year he still becomes a non resident immediately on leaving India under certain circumstances. 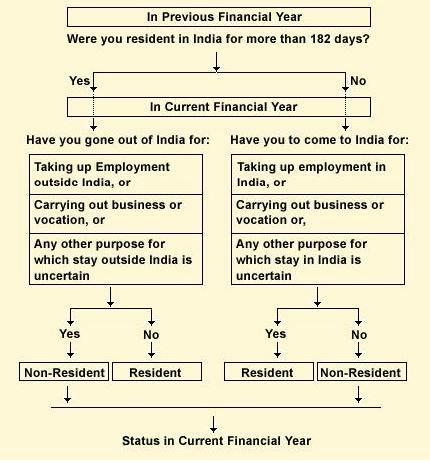 So You become a non resident as soon as you leave India to take up an employment outside India or to start any business or profession outside India or leave the country with an intention to stay outside for an indefinite period. So in the circumstances given above you will become a non resident as soon as your flight takes off or your ship sails on water irrespective of your stay in India and that too without having to wait for the year end. 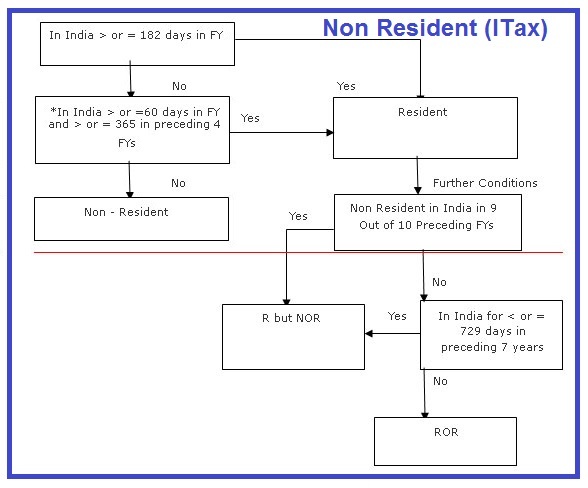 However if you leave India for medical treatment or on a business trip or on holidays or even for study, you would still not become a non resident under FEMA as the intention to stay outside India is for a definite period and is not for an indefinite period though you may become a non resident under tax laws due to physical stay. Likewise one will become a resident under FEMA if he comes to India for taking up an employment or for carrying on any business or profession or comes back to India to spend retirement years here in India. He will become resident under FEMA immediately on arrival in India. Unlike Tax Laws where residential status is determined at the end of the year based on the physical stay, the status under FEMA changes instantly when a person either leaves the country with an intention to stay out of India for uncertain period of time or comes to India with an intention to stay here for indefinite period of time. So you would become a non resident if you leave the country to spend your retired life with your children immediately but you would still be a resident if you leave the country to take care of your daughter in law during her pregnancy in US. The residential status under FEMA is important to determine as to what type of investments you can make in India or how you can remit money outside India. Please note that residential status under FEMA and tax law has nothing to do with your citizenship.